pt(n) 1 tcllib "Parser Tools"
This document describes pt, the main application of the module, a parser generator. Its intended audience are people who wish to create a parser for some language of theirs. Should you wish to modify the application instead, please see the section about the application's Internals for the basic references. It resides in the User Application Layer of Parser Tools. This sub-command of the application reads the parsing expression grammar stored in the inputfile in the format inputformat, converts it to the resultformat under the direction of the (format-specific) set of options specified by the user and stores the result in the resultfile. The inputfile has to exist, while the resultfile may be created, overwriting any pre-existing content of the file. Any missing directory in the path to the resultfile will be created as well. A resultformat. See section C Parser. A resultformat. See section Grammar Container. A resultformat. See section C Parser Embedded In Tcl. A input- and resultformat. See section JSON Grammar Exchange. A resultformat. See section TclOO Parser. A input- and resultformat. See section PEG Specification Language. A resultformat. See section Snit Parser. Of the seven possible results four are parsers outright (c, critcl, oo, and snit), one (container) provides code which can be used in conjunction with a generic parser (also known as a grammar interpreter), and the last two (json and peg) are doing double-duty as input formats, allowing the transformation of grammars for exchange, reformatting, and the like. The fastest parsers are created when using the result formats c and critcl. The first returns the raw C code for the parser, while the latter wraps it into a Tcl package using CriTcl. This makes the latter much easier to use than the former. On the other hand, the former can be adapted to the users' requirements through a multitude of options, allowing for things like usage of the parser outside of a Tcl environment, something the critcl format doesn't support. As such the c format is meant for more advanced users, or users with special needs. A disadvantage of all the parsers in this section is the need to run them through a C compiler to make them actually executable. This is not something everyone has the necessary tools for. The parsers in the next section are for people under such restrictions. As the parsers in this section are implemented in Tcl they are quite a bit slower than anything from the previous section. On the other hand this allows them to be used in pure-Tcl environments, or in environments which allow only a limited set of binary packages. In the latter case it will be advantageous to lobby for the inclusion of the C-based runtime support (notes below) into the environment to reduce the impact of Tcl's on the speed of these parsers. The relevant formats are snit and oo. Both place their result into a Tcl package containing a snit::type, or TclOO class respectively. Of the supporting runtime, which is the package pt::rde, the user has to know nothing but that it does exist and that the parsers are dependent on it. Knowledge of the API exported by the runtime for the parsers' consumption is not required by the parsers' users. The last category, grammar interpretation. 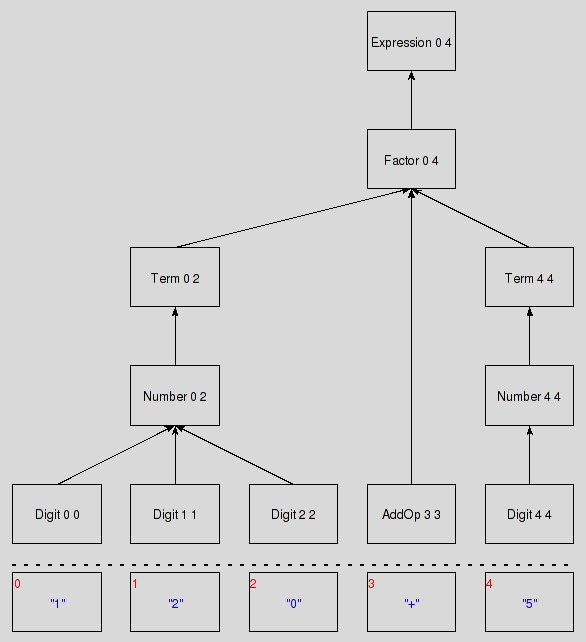 This means that an interpreter for parsing expression grammars takes the description of the grammar to parse input for, and uses it guide the parsing process. This is the slowest of the available options, as the interpreter has to continually run through the configured grammar, whereas the specialized parsers of the previous sections have the relevant knowledge about the grammar baked into them. The only places where using interpretation make sense is where the grammar for some input may be changed interactively by the user, as the interpretation allows for quick turnaround after each change, whereas the previous methods require the generation of a whole new parser, which is not as fast. On the other hand, wherever the grammar to use is fixed, the previous methods are much more advantageous as the time to generate the parser is minuscule compared to the time the parser code is in use. The relevant result format is container. It (quickly) generates grammar descriptions (instead of a full parser) which match the API expected by ParserTools' grammar interpreter. The latter is provided by the package pt::peg::interp. All the parsers generated by critcl, snit, and oo, and the grammar interpreter share a common API for access to the actual parsing functionality, making them all plug-compatible. It is described in the Parser API specification document. For either an introduction to or the formal specification of the language, please go and read the PEG Language Tutorial. The value of this option is a string into which to put the generated text and the values of the other options. The various locations for user-data are expected to be specified with the placeholders listed below. The default value is "@code@". To be replaced with the value of the option -user. To be replaced with the value of the option -file. To be replaced with the value of the option -name. For the formal specification of the JSON grammar exchange format, please go and read The JSON Grammar Exchange Format. The critcl format is executable code, a parser for the grammar. It is a Tcl package with the actual parser implementation written in C and embedded in Tcl via the critcl package. The value of this option is the name of the class to generate, without leading colons. The default value is CLASS. For a simple value X without colons, like CLASS, the parser command will be X::X. Whereas for a namespaced value X::Y the parser command will be X::Y. The value of this option is the name of the package to generate. The default value is PACKAGE. The value of this option is the version of the package to generate. The default value is 1. The c format is executable code, a parser for the grammar. The parser implementation is written in C and can be tweaked to the users' needs through a multitude of options. The critcl format, for example, is implemented as a canned configuration of these options on top of the generator for c.
The value of this option is a string into which to put the generated text and the other configuration settings. The various locations for user-data are expected to be specified with the placeholders listed below. The default value is "@code@". To be replaced with the the constant C/PARAM. To be replaced with the generated Tcl code. The following options are special, in that they will occur within the generated code, and are replaced there as well. To be replaced with the value of the option state-decl. To be replaced with the value of the option state-ref. To be replaced with the value of the option string-varname. To be replaced with the value of the option self-command. To be replaced with the value of the option fun-qualifier. To be replaced with the value of the option namespace. To be replaced with the value of the option main. To be replaced with the value of the option prelude. A C string representing the argument declaration to use in the generated parsing functions to refer to the parsing state. In essence type and argument name. The default value is the string RDE_PARAM p.
A C string representing the argument named used in the generated parsing functions to refer to the parsing state. The default value is the string p.
A C string representing the reference needed to call the generated parser function (methods ...) from another parser fonction, per the chosen framework (template). The default value is the empty string. A C string containing the attributes to give to the generated functions (methods ...), per the chosen framework (template). The default value is static. The name of the C namespace the parser functions (methods, ...) shall reside in, or a general prefix to add to the function names. The default value is the empty string. The name of the main function (method, ...) to be called by the chosen framework (template) to start parsing input. The default value is __main. The name of the variable used for the table of strings used by the generated parser, i.e. error messages, symbol names, etc. The default value is p_string. A snippet of code to be inserted at the head of each generated parsing function. The default value is the empty string. The number of characters to indent each line of the generated code by. The default value is 0. A flag controlling the generation of code comments containing the original parsing expression a parsing function is for. The default value is on. The snit format is executable code, a parser for the grammar. It is a Tcl package holding a snit::type, i.e. a class, whose instances are parsers for the input grammar. The value of this option is the name of the class to generate, without leading colons. Note, it serves double-duty as the name of the package to generate too, if option -package is not specified, see below. The default value is CLASS, applying if neither option -class nor -package were specified. The value of this option is the name of the package to generate, without leading colons. Note, it serves double-duty as the name of the class to generate too, if option -class is not specified, see above. The default value is PACKAGE, applying if neither option -package nor -class were specified. The oo format is executable code, a parser for the grammar. It is a Tcl package holding a TclOO class, whose instances are parsers for the input grammar. The container format is another form of describing parsing expression grammars. While data in this format is executable it does not constitute a parser for the grammar. It always has to be used in conjunction with the package pt::peg::interp, a grammar interpreter. The format represents grammars by a snit::type, i.e. class, whose instances are API-compatible to the instances of the pt::peg::container package, and which are preloaded with the grammar in question. The value of this option controls which methods of pt::peg::container instances are used to specify the grammar, i.e. preload it into the container. There are two legal values, as listed below. The default is bulk. In this mode the methods start, add, modes, and rules are used to specify the grammar in a bulk manner, i.e. as a set of nonterminal symbols, and two dictionaries mapping from the symbols to their semantic modes and parsing expressions. In this mode the methods start, add, mode, and rule are used to specify the grammar piecemal, with each nonterminal having its own block of defining commands. The value of this option is a string into which to put the generated code and the other configuration settings. The various locations for user-data are expected to be specified with the placeholders listed below. The default value is "@code@". To be replaced with the the constant CONTAINER. To be replaced with the value of the option -mode. To be replaced with the generated code. This section is intended for users of the application which wish to modify or extend it. Users only interested in the generation of parsers can ignore it. 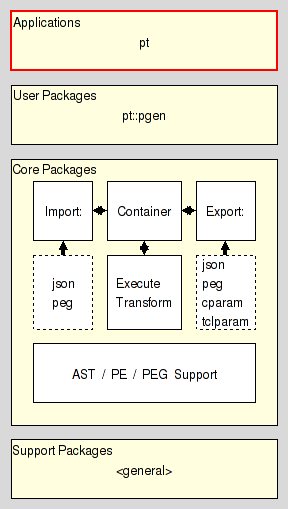 The main functionality of the application is encapsulated in the package pt::pgen. Please read it for more information.